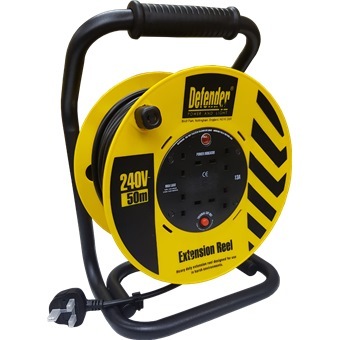 DEFENDER INDUSTRIAL CABLE REEL 50M is rated 4.8 out of 5 by 9. 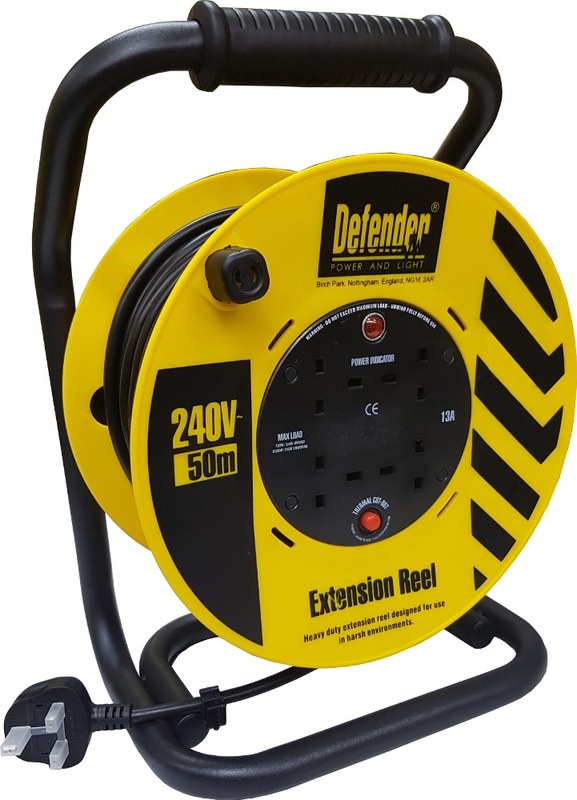 Defender HD Extension Reels are extremely durable cable reels made for general site use. With toughened steel frames and recessed sockets they’re made to endure site and industrial applications. Rated 5 out of 5 by Kenneth Ng from Excellent Product I was looking for a long extension cord for outdoor use and I bought the Defender Industrial Cable reel. The purchase process was seamless and trouble free and it was delivered on time. The build quality of the reel is excellent and it has four sockets for you to plug things in. It looks very hardy and easy to use. I am glad I bought it. Rated 4 out of 5 by AChan from Good product Great for handy electrical work around the house where the usual short extension cables just don't reach. Convenient handle, not heavy, well made. Rated 5 out of 5 by Petercky319 from Solid and Durable Second time purchasing this. Have had the first one for a few years already. Really durable frame and construction. Used without any issue. Not the lightest around, but that's because of it's extremely solid construction. Rated 5 out of 5 by tansg from Very good Works as described... Fantastic and durable.. Must buy! Rated 4 out of 5 by chungbro from Cable Reel I bought this product recently and find it is well built and working fine. Rated 5 out of 5 by Randomosity from Good stuff! Items came in it's best quality! Good delivery service. Called before arriving.